Syrian Army Rapidly Expands Corridor To Western Part Of Deir Ezzor City (Photos, Videos) 4.8 out of 5 based on 15 ratings. 15 user reviews. On Thursday, the Syrian Arab Army (SAA) and its allies expanded a corridor to the 137th Brigade Base and captured 10km-wide area around the road from ISIS, according to the Hezbollah media wing in Syria. 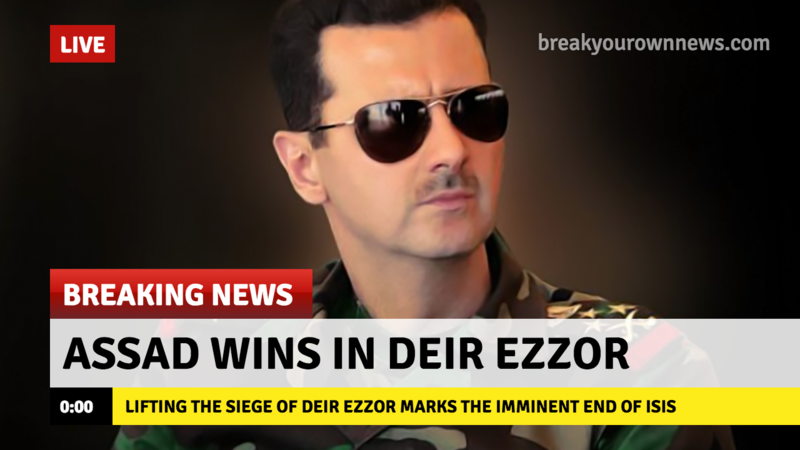 The media added that the SAA fully secured the road after it captured all the heights on the both sides of it. The SAA also advanced from al-Sunuf hill north of Deir Ezzor city towards the Aaiash area and captured the Raqqa bridge and a gas station in the northwestern Deir Ezzor countryside. Russian and Syrian warplanes conducted dozens of airstrikes on ISIS positions in Deir Ezzor city in order to support the SAA advance, according to pro-government sources. The SAA media department released a video of Russian and Syrian airstrike on ISIS vehicles around Deir Ezzor city. In a related development, the Syrian Arab News Agency (SANA) announced that 7 civilians were killed and 29 others were injured in a mortar attack of ISIS on Harabesh district in the southern part of Deir Ezzor city. Meanwhile, more Liwa al-Quds units deployed to Deir Ezzor in order to combat ISIS terrorists in its countryisde. Meanwhile, the Hezbollah media wing in Syria announced that 40 trucks carrying humanitarian aid entered Deir Ezzor city on Thursday. More trucks will be able to enter Deir Ezzor city once the SAA recaptures al-Shula village on the al-Sukhnah-Deir Ezzor highway. It seems Israel again planning for attack on Syria tonight. Syria and SAA will have to prepare for war with Israel, after ISIS and FSA and other terror group are defined, as the Israeli always gone be attacking SYria. Before this can happen Assad need to get own Air Defence System, obtain advance Airplanes, Attack and transport helicopters, and ground military hardware and better train SAA troops and Officers. Now is the time to obtain in order military troops get train on it and tactical and strategic planning using such military hardware. Syria has no much to loose, as is destroyed already. Israel has more to lose than Syria, mentally, physically and financially. How will he attempt to get compensation for these damages? Through what legal process? International law is still existent. As with any event in history, with time there comes truth. The more is revealed, actually a lot of truth already has been revealed regarding the Syrian conflict, more than any other historical event so far from what I can see, the more likely it is that this is raising the bars for another conflict of similar magnitude. Furthermore, that Syria hopefully receives compensation the one way or the other. It is very important to make it clear to the wicked people of this world, that it won’t be as easy anymore to push their intentions through with even the most inhuman options at hand. If we want peace, we have to make sure that there are tools at hand to make sure that the opposite becomes too costly. Iraq has paid various countries, corporations and individuals a total of $47 billion so far for compensation as a result of its invasion of Kuwait in 1990-1991. This was the result of the UN Compensation Commission. The money was raised by a levy on Iraqi oil sales. There are suggestions though that this Compensation Commission was really set up as part of a political process rather than a strictly legal process. Given the political dimensions of the conflict I would assess Syria’s chances of gaining actual compensation as close to zero. They have already been on that as this will be a claims of reparations against the parties involved on the Coalition side, so they will go to great lengths to push the lies of the Chemical attacks. Which can be countered by the Syrians and Russians already and those involved may not like the outcome. If you send them the money that Syria can actually afford all these nifty toys, then maybe. The reality is, the country lies in ruins and Russia is literally delivering stockpiled tanks for free. One of the main reasons why Russia has such a strong influence on Syria. Hezbollah and Iran together are nice allies, but without Russia the war would have been lost nevertheless, no matter the support of them. My utmost admiration for Commander Zahreddine, leader of all forces in Deir es-Zor, for making sure that city was still in the hands of the Syrian government when the Tiger Brigade got there!! General Issam Zahr eddin was the planner for the push from Sukhna to DE, he is as always a consummate planner and tactician.This man is also very hands on in the early days when dealing with the terrorists he would actually shoot them if the soldiers couldn’t get them in three shots he would only take one.